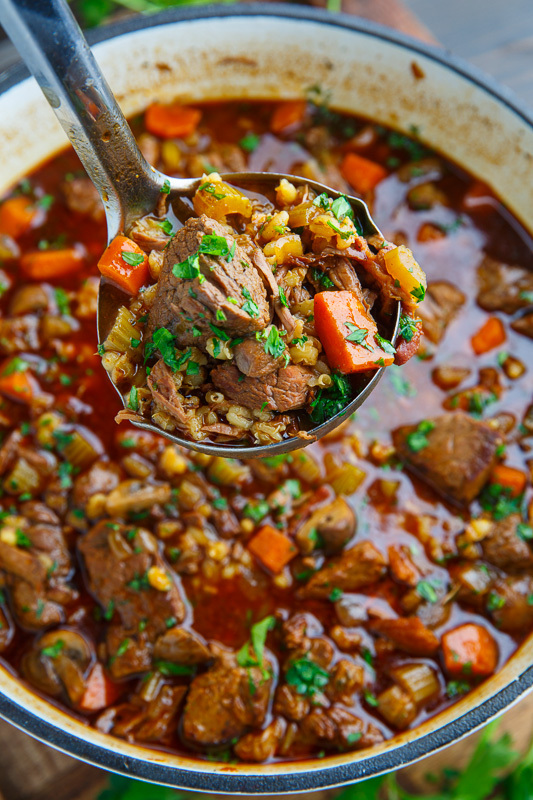 Combine all ingredients in a pitcher and stir together well to combine. Refrigerate for a bit to chill and allow the apples to soak up the flavors. Pour over ice into 5 glasses. 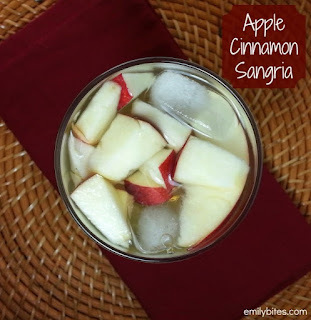 Each glass gets ¾ fl cup (6 oz) of the liquid cocktail and 1/5 of the chopped apples. Cover the dried mushrooms in 1 cup of just boiled water and let sit until tender, about 15 minutes, before draining, reserving the water, and chopping the mushrooms. Meanwhile, cook the bacon in a larges sauce pan over medium-high heat before setting aside. Add the beef and sear until lightly golden brown on all sides before setting aside. Add the onions, carrots, celery and mushrooms and cook until tender, about 7-10 minutes. Add the garlic, thyme, paprika and tomato paste and cook until fragrant, about 1-2 minutes. Add the broth and deglaze the pan by scraping up the brown bits on the bottom of the pan with a wooden spoon while the broth simmers..
Add the broth, barley, bacon, beef, reserved chopped mushrooms, reserved mushroom water, bay leaves, balsamic vinegar, worcestershire sauce and fish sauce and either bring to a boil, reduce the heat and simmer, covered, until the beef is fall apart in your mouth tender, about 2-3 hours, OR transfer to a preheated 350F/180C oven and roast, covered, until the beef is tender, about 2-3 hours, OR transfer to a slow cooker and cook on low for 6-10 hours or on high for 3-5 hours. Remove the bay leaves, season with alt and pepper to taste and enjoy! Pour over saltine crackers. Place in a 375°F oven for about 10 minutes, until crackers are browned and caramelized. Sprinkle with white chocolate chips and allow to sit for several minutes (until they melt). 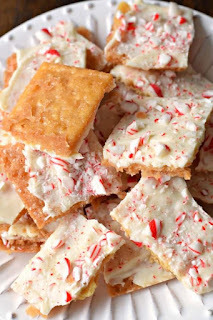 Spread with a spatula evenly over crackers and immediately sprinkle with crushed candy. Allow chocolate to set and store in airtight container for up to 5 days. I LOVE apple sangria! That's probably my fave.